This talavera sugar bowl with lid and other dishware and serving pieces are lead-free and safe for serving food and using as dinnerware. Talavera is dishwasher and oven safe. All of our Mexican Talavera dishes and serving pieces are handmade and hand painted by Mexico's talented potters. Traditional Assortment: The design shown is of the Traditional Talavera style. Ordered items will be chosen from our current assortment of available colors and designs. The sugar bowl you receive will likely be different than pictured here. 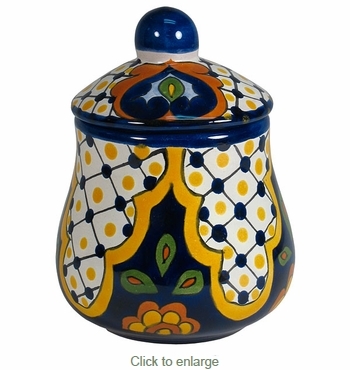 Specific Talavera patterns available - Click Here.